This natural handmade soap is going to be exactly what you never knew you needed. Our artisan European clay soap is available in natural lemon verbena or scent-free. This offers you the nourishment you desire without synthetic fragrances. Our handmade soap is also color-free and works well for most skin types. 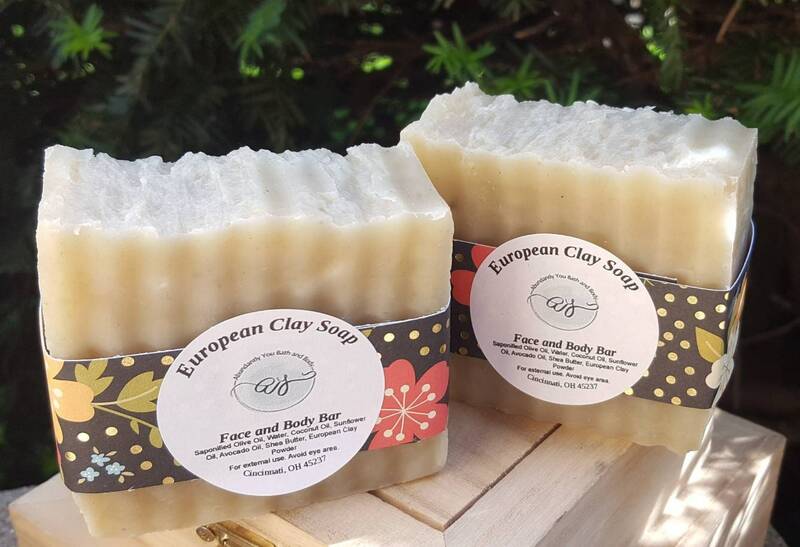 The European clay soap bar is vegan-friendly and will fit perfectly into your self-care regimen. European clay draws impurities and helps to tone the skin. It works well for most skin types, especially normal, combination, and oily skin. Additional ingredients like Shea butter and avocado oil add moisturizing properties to this soap bar. Abundantly You natural soaps are crafted from scratch. We are careful to use ingredients that you can trust. Each ingredient promotes a natural, clean, bath experience. The only thing now is to put it to the test and see how you like it as part of your beauty routine. Ingredients include Extra Virginia Olive Oil, Distilled Water, Coconut Oil, Sunflower Oil, Avocado Oil, Shea Butter, and European Clay Powder. To extend the life of your European clay soap bar, keep dry between showers. Each full-size soap bar weighs approximately 4 ounces. Very few products are truly good for your skin and good for sensitive skin but I have found that these products have passed that test. I have extremely sensitive skin and cannot use commercial soap on my face without breaking out into a rash. The facial soap and soap from this shop is very gentle on my easily offended skin and I will be a long term customer. Thanks!